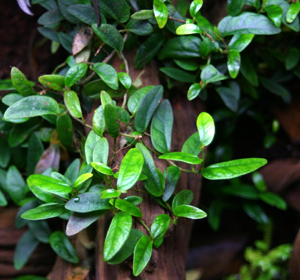 This ficus is a terrific creeping and vining species that has an unusual characteristic of holding it's leaves nearly horizontal, thus giving it an almost shingled appearance. Its moderate growth rate allows it to fill in an area relatively fast without becoming invasive. Very different than Ficus pumila varieties and quite rare. Available plants are growing in 3" deep pots.